J. C. (James) Walton age 84, of Gurdon, passed away Sunday, November 25, 2018 at his home. He was born October 26, 1934 in Strong, Arkansas to the late Franklin Coleman and Mamie Walton. J. C. was an active member of Calvary United Pentecostal Church where he served with the Foreign Missionary Program. 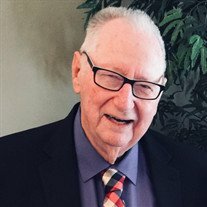 He was a veteran of the U. S. Army and Navy and a retired supervisor with Georgia Pacific in Ashdown, Arkansas. He was preceded in death by his first wife, Lucille Walton and one son, Victor Walton. Survivors are his wife, Audrey Walton; one son, Donald Walton and wife, Donna of Benton; one daughter, Angela Renee Pettigrew of Ashdown; one step-daughter, Lavonda Diemer and husband, James of Camden; one step-son, Steven Nimitz and wife, Tina of Orange, Texas; one brother, Tommy Walton and wife, Mertis of Texas City, Texas; grandchildren, Josh Pittman, Caleb Pittman, Josiah Pettigrew, Rachel Pittman and Jarred Walton; a host of great-grandchildren, nieces and nephews. Services will be at 7:00 PM Tuesday, November 27th at Calvary United Pentecostal Church with Rev. Bill O'Connell officiating. Visitation will 5:00 PM Tuesday until service at the church. Interment with military honors will be 10:00 AM Wednesday, November 28th at Rose Hedge Cemetery in Gurdon.